Organisers of the hugely popular Liverpool Pride Festival have announced that the free event will return for its ninth consecutive year during the Summer of 2018. The region’s established annual celebration of all things LGBTQ+ will again take place across two days – Saturday 28 July and Sunday 29 July 2018. The location will be revealed soon. 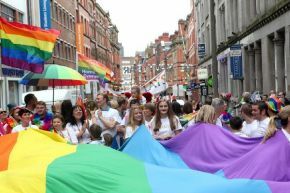 Liverpool Pride has grown to become one of the city’s major annual events, last year a record 8000 people joined the march and over 50,000 enjoyed two days of entertainment to celebrate lesbian, gay, bisexual and transgender communities. The theme for 2018 has also now been revealed as #AllTogetherNow, which encompasses every branch of the LGBTQ+ and wider communities coming together no matter what their ethnicity, gender, sexuality, belief or however they define themselves in celebration of equality and diversity. John Bird, Trustee of Liverpool Pride Charity said: “We're so excited to finally be releasing news of this year’s Liverpool Pride. 2018 is a momentous year for the city, and we wanted to add to that in the best way Pride possibly could. This year's theme can be interpreted in so many different ways; but mostly we see it as all our communities coming together in joint celebration of equality, diversity and visibly demonstrating that no matter what our gender, ethnicity, sexuality, faith or however a person identifies, we are #AllTogetherNow. “2018, as well as being the 10 years since Liverpool was European Capital of Culture, also marks 10 years since Michael Causer, a 18 year old young man, tragically lost his life after being victim to a hate crime - we honour him now, as we do every year, as it was this tragedy that was the rallying call for the modern day Liverpool Pride movement. We have some big surprises in store for this year's event, so stay tuned!" The Liverpool Pride Festival 2018 will also mark 10 years since the death of murdered gay teenager Michael Causer, who tragically lost his life on 2 August 2008. The festival was specifically created in 2010 in Michael’s memory as a way to celebrate his life and to empower the LGBT communities, and each year the festival coincides with the anniversary of Michael’s death. The festival continues to remind the community to stand up for LGBT culture and equality through a city-wide celebration where everyone is welcome. As always, the Liverpool Pride March will play a major role in the weekend’s programme, bringing the city to a halt in a poignant and joyous chance for everyone to get involved. Full details will also be announced in the coming months about the community engagement events and specific programming and projects which are planned round the festival dates. Liverpool Pride’s #AllTogetherNow theme will also complement a city-wide season of events and performances to mark #Liverpool2018 - 10 years since European Capital Of Culture. Watch the official Liverpool Pride 2018 trailer in our video box.